The Blacksburg Farmers Market presents the August 2018 and final 2018 Mingle at the Market with music from Mateo Monk on Wednesday, August 15, 2018 at Market Square Park. Enjoy live tunes, cold drinks including beer from Starr Hill, cider from Bold Rock and wine from Beliveau Estate Winery and all of our vendors seasonal offerings! We will also have food trucks and pizza ovens. 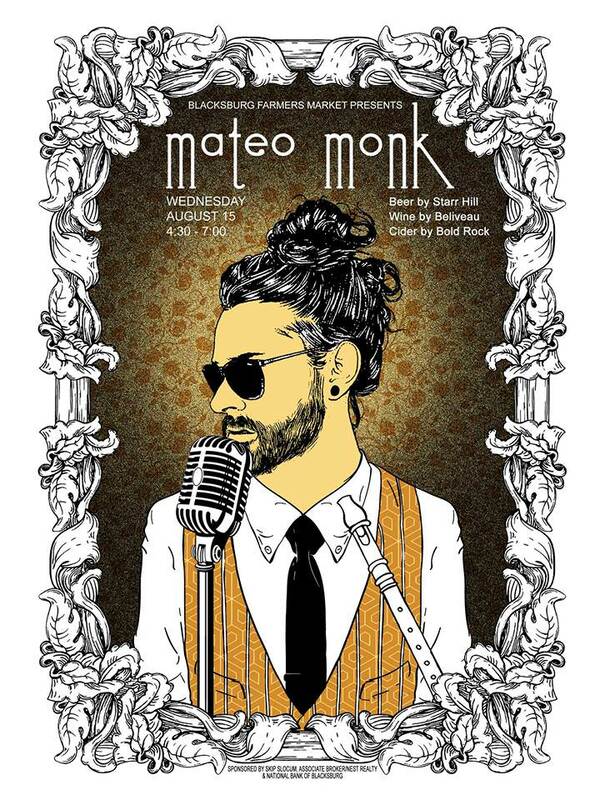 The music of Mateo Monk is beyond classification. It is a synthesis of multiple genres of world roots music, heavily informed by the spontaneous freedom of psychedelic jam culture. Mateo performs solo on the guitar, flute, synthesizer, and melodica, utilizing a looper pedal to create fully-textured rhythms, adorned with virtuosic melodic musings, all seamlessly woven into the song form in real time. It's a modern spin on the iconic idea of the "one man band", executed by a one-of-a-kind artist with deep emotional sensibility and dazzling instrumental finesse. Mateo has been performing for 23 years and has worked with many influential artists, including Thievery Corporation, Junior Marvin of Bob Marley and The Wailers, and members of the legendary reggae group Culture. All proceeds will benefit the work of Friends of the Farmers Market. To view the event flyer, visit: https://i.imgur.com/ruCT0sF.jpg. For more information, visit: http://blacksburgfarmersmarket.com/ or https://www.facebook.com/blacksburgfarmersmarket/.